“Stoker” is the U.S.-directorial debut of the great South Korean director Park Chan-wook (“Sympathy for Mr. Vengeance,” “Oldboy,” “Thirst”) and it’s quite an achievement. What starts out as a dysfunctional family drama spirals into an involving and intriguing mystery-thriller that becomes a modern-day riff on Hitchcock’s “Shadow of a Doubt” — but without the sheen of mid-1940s innocence. This film is dark, rude and off-kilter through and through, with a cast of characters whose motives and actions just can’t be fathomed — at first. The story line: India Stoker (Mia Wasikowska) was not prepared to lose her father (who was also her best friend) (Dermot Mulroney) in a tragic auto accident. She’s an outcast in her own mind and an outcast at school (one who knows how to defend herself when bullied by one of her male schoolmates). The solitude of her woodsy family estate and the unspoken somberness of her home life are suddenly upended by the sudden arrival of her Uncle Charlie (Matthew Goode), whom she never knew existed. When Charlie moves in with her and her emotionally unstable mother Evie (Nicole Kidman, in another of her against-the-grain-casting roles), India thinks the void left by her father’s death is finally being filled by his closest bloodline. But soon after his arrival, India comes to suspect that this mysterious, charming man has ulterior motives. Uncle Charlie first makes moves on Evie, then decides he wants to get closer to India. But instead of feeling outrage or horror, the girl becomes increasingly infatuated with him, eventually unraveling a horrible mystery that has soiled the Stoker family’s past. Though it wasn’t a huge boxoffice success, “Stoker” — written by actor Wentworth Miller — is one of the most original and auspicious releases of the year. Blu-ray extras include “An Exclusive Look: A Filmmakers Journey”; deleted scenes; “Behind the Scenes: Mysterious Characters, Designing the Look, Creating the Music”; more. “Jack the Giant Slayer”: Director Bryan Singer transfers the greenscreen and special effects he used so well in the big screen versions of Marvel Comics’ “X-Men” to a fairy tale — with less illustrious results. Actually, Singer takes the Jack and the Beanstalk fairy tale and translates it into a myth: Ancient monks, in their effort to literally climb to heaven, plant magic beans that grow into a pathway to a land in the sky unfortunately inhabited by human-eating giants, who travel down the beanstalk to conquer mankind. Fortunately, a brave king creates a magical crown that controls the giants, defeating them and sending them back to their land. Centuries later, the evil advisor to the current king uncovers the ancient monks’ beans and when they unwittingly fall into the hands of a young peasant, Jack, the gateway between Earth and the giants’ lair is reopened, and the fight for the world begins again — forcing Jack into the battle of his life to stop them. The film was a critical and financial failure and for good reason: the acting is bland and artificial, the story line uneventful and predictable. Nicholas Hoult is a whitebread hero as Jack, Stanley Tucci plays his role as Roderick, the evil advisor, with off putting aplomb; the only person really having fun here is Ewan McGregor as head of the king’s army — he must have been tickled pink with the size of his paycheck. Is this the Bryan Singer of “The Usual Suspects”? Co-stars Eleanor Tomlinson, Warwick Davis, Ian McShane, Bill Nighy and Ewen Bremner. Extras include deleted scenes and a gag reel. The Blu-ray version adds a “Become a Giant Slayer” interactive game. “Marketa Lazarova” (1967) In its home country, Frantisek Vlacil’s “Marketa Lazarova” has been hailed as the greatest Czech film ever made; for many U.S. viewers, it will be a revelation. Based on a novel by Vladislav Vancura, in turn based on a centuries-old Czechoslovakian legend, this stirring and poetic depiction of a feud between two rival medieval clans is a fierce, epic, and meticulously designed evocation of the beginning clashes between Christianity and paganism, humankind and nature, love and violence in the Middle Ages. The plot is simple: The two sons of a pagan lord, Kozlik, rob travelers on the road to the capital and, during one robbery, kidnap the son of a German diplomat on his way to the king. In need of support to fend off an imminent attack by the king’s men, Kozlik sends his sons to neighbor lord Lazar to entice him to join him in war. When Lazar refuses, the sons kidnap his daughter, Marketa Lazarova, just when she was ready to join a convent; she’s then deflowered and made to become one of the son’s concubines. The fighting and brutality continue as the Kozlik and Lazar clans fight back and forth and, eventually, the king’s army attacks Kozlik. Despite the film’s title, it’s not really about Marketa Lazarova — she doesn’t even set off any of the film’s main actions — but rather about her epoch, environment and the events that swirl around her; she’s kind of a symbol for paganism slowly giving way to Christianity. Vlacil’s approach was to re-create the textures and mentalities of a long-ago way of life, rather than to make a conventional historical drama, and the result is dazzling. With its inventive widescreen cinematography, editing, and sound design, “Marketa Lazarova” is an experimental action film. It seamlessly moves between dreams, illusions, point-of-view action shots, flashbacks and religious imagery, all set against the backdrop of a winter white pagan world. I don’t think I’ve ever seen a film with such ruthless, brutal and amoral characters — but without the gore and gruesomeness that one associates with violence and brutality. This is, after all, the 13th century, a violent, horrible world, and brutality and amorality is the norm. It’s a beautifully fascinating film, one you can’t keep your eyes off. 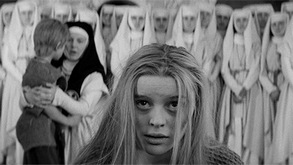 Or, as DVDTalk put it, “‘Marketa Lazarova’ is a dizzying step far back into the mysterious, mystically-minded Middle Ages, but it’s no period piece, nor even a modern-world-aimed allegory like Bergman’s also-medieval ‘Seventh Seal.’ What the film is, indelibly and rapturously, is a visceral, full-blooded (in every sense) immersion in medieval thinking, what the world looked and felt like to our 13th-century forebears.” Another terrific “find” from Criterion. 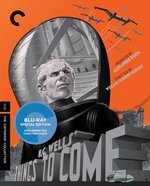 “Things to Come” (1936) is one of the most overlooked science fiction films of all time, a classic that, perhaps due to its bleakness and lack of science fiction gee-whiz gadgetry or monsters, has largely been ignored in the sci-fi pantheon. The film was a landmark collaboration between writer H. G. Wells (who oversaw the script, based on his 1933 book “The Shape of Things to Come”), producer Alexander Korda and designer and director William Cameron Menzies. Both the book and the film were prescient political works that predicted a century of turmoil and progress, beginning in the late 1930s with the outbreak of a 30-year war that devastates civilization, turning the world into tribal enclaves ruled by warlords. There’s a worldwide disease, The Walking Sickness, and a desolate future that would be mimicked by George Miller in “Mad Max 2: The Road Warrior.” Eventually a scientist class arises, dubbed Wings Over the World, which brings technology and civilization back to humankind, eventually leading to a utopian (if emotionless) world and the conquest of space. “Things to Come” was one of the most expensive British productions of its day, a triumph of imagination and technical audacity. It wasn’t as well received as the filmmakers had hoped, and the original 108 minute British release was cut to 96 minutes for the states; the film was further cut to 98, 96 and 92 minutes for subsequent British and U.S. releases; the latter length has been the dominant release print from the 1970s to the present. Criterion is releasing a 96 1/2-minute version in a new high-definition digital film restoration, with uncompressed monaural soundtrack on the Blu-ray edition. The film stars Raymond Massey, Edward Chapman, Ralph Richardson, Margaretta Scott, Cedric Hardwicke and Ann Todd. Extras include commentary featuring film historian and writer David Kalat; an interview with writer and cultural historian Christopher Frayling on the film’s design; an audio recording from 1936 of a reading from H. G. Wells’s writing about the “wandering sickness”; a booklet featuring an essay by critic Geoffrey O’Brien; and more. Highly recommended. Also from Criterion is “Safety Last!” (1923), featuring the comic genius of silent star Harold Lloyd. While Chaplin was the sweet innocent and Keaton the stoic outsider, Lloyd — ­the modern guy striving for success — was everyman. Here Lloyd plays a small-town bumpkin trying to make it in the big city, who finds employment as a lowly department-store clerk. He comes up with a wild publicity stunt to draw attention to the store, resulting in an incredible feat of derring-do on his part that gets him started on the climb to success. In a new 2K digital film restoration with a musical score by composer Carl Davis from 1989, synchronized and restored under his supervision and presented in uncompressed stereo on the Blu-ray edition. Extras include commentary featuring film critic Leonard Maltin and director and Harold Lloyd archivist Richard Correll; “Harold Lloyd: The Third Genius,” a 104-minute documentary from 1989; three newly restored Lloyd shorts: “Take a Chance” (1918), “Young Mr. Jazz” (1919) and “His Royal Slyness” (1920); a booklet featuring an essay by critic Ed Park; and more. Leaving the world of classics we travel to the surreal wild and wooly world of “Lifeforce” (1985), a cheesy sci-fi thriller from director Tobe Hooper about a naked female vampire from outer space who arrives in London and promptly begins to infect the entire population by feasting on the human energy of her victims, turning the city into a crazy madhouse of vampire/zombie hybrids. Roundly lambasted critically — and flopping at the boxoffice when first released — the film had fallen into obscurity until it was resurrected and restored by the folks at Scream Factory/Shout! Factory for a DVD/Blu-ray combo release (it was also selected by Chicago’s Music Box Theatre to screen as part of its two-week festival of 70mm movies in February, alongside “West Side Story,” ” 2001: A Space Odyssey” and “Vertigo”). It’s definitely time for a re-evaluation. 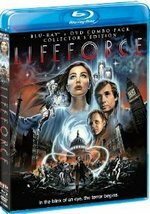 (“Lifeforce” was loosely based on the novel “The Space Vampires” by philosopher Colin Wilson). The film stars Steve Railsback, Peter Firth, Frank Finlay, Patrick Stewart, Nicholas Ball and Mathilda May. The Blu-ray Collector’s Edition includes both theatrical and international versions. Extras include commentary with director Tobe Hooper; a new retrospective with cast and crew including star Railsback, Hooper and others; an original vintage “Making-of Lifeforce” featurette; original theatrical trailer; TV spot; still gallery. (1981), directed by Joe Dante and starring Dee Wallace, Patrick Macnee, Dennis Dugan, Christopher Stone, Belinda Balaski, Kevin McCarthy, John Carradine, Slim Pickens and Elisabeth Brooks. “The Howling” helped kick off a short werewolf resurrection in the early 1980s, a skein that included “An American Werewolf in London” and culminated with “Teen Wolf.” After a TV newscaster helps police track down a serial killer, she travels to the countryside to clear her head, only to discover that the killer came from a cabal of werewolves living close to her retreat. On DVD and Blu-ray Disc. Extras include commentary with director Joe Dante and actors Dee Wallace, Christopher Stone and Robert Picardo; “Unleashing the Beast: The Making of the Howling” multi-part documentary; deleted scenes and outtakes; and more.